The Emerald Archer goes on the offensive in Green Arrow #16, but the odds are stacked against him after being framed by the Dark Archer Malcolm Merlyn for a recent wave of murders in Seattle, hounded by a rogue team of corrupt cops called The Vice Squad, and vilified by a detestable mayoral candidate. Things don’t look good for Green Arrow and Co, but all that could soon change with the return of an old ally….Emiko Queen! Emerald Outlaw Part 5 sees Green Arrow, Black Canary, and Chief Westberg setting out to deal with Sergeant Notting and The Vice Squad once and for all! First though, writer Benjamin Percy brings us the long awaited reunion between Green Arrow and his sister, Emi – AKA Red Arrow. Her tangle with her mother and the Yakuza bosses has made Emi tougher than ever, she’s back and – hugging aside – on her terms! From here Green Arrow #16 races along at a furious pace, as Benjamin Percy sets the scene for the showdown between the Emerald Archer, his allies, and The Vice Squad in a hanger outside Seattle, where the moral arguments of this arc become polarized like never before as the fists, bullets and arrows start flying left right and centre. 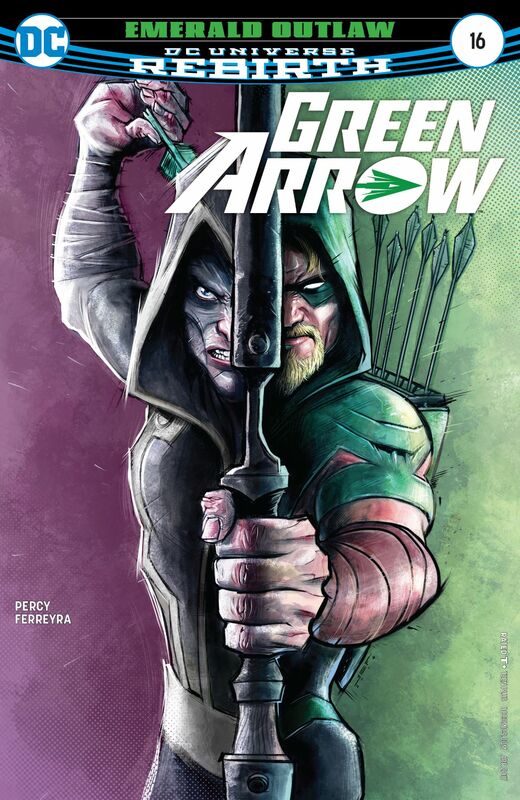 This is a mighty fine looking issue of Green Arrow, the terrific art and colors by Otto Schmidt are true spectacle to behold, and every page is crammed with action, speed, and motion as the face-off in the hanger unfolds towards its explosive and poignantly honourable conclusion. The initial reunion between Oliver and Emi is also nicely portrayed, and the running joke of everyone getting used to calling Emi by the moniker of Red Arrow is great fun. I also really like how Otto Schmidt’s chameleon-like use of color pitches the mood of each scene, perfectly matching them with the beats of the storyline, with vivid tones for the more emotional moments, while cool dark shades heighten the menace and danger of the fight in the hanger. However, it is the multifaceted aftermath of this battle where story and art fuse beautifully as one, with media reports, a word in a mayoral candidates ear, and a tender repairing of bonds to make a family whole again that provides some of the most moving and heart-warming moments we’ve seen in this series so far, and it reaffirms my view that Green Arrow is one of the strongest titles to emerge from DC Comics Rebirth. Green Arrow #16 is the kind of issue that makes us love these characters so much. Benjamin Percy and Otto Schmidt have delivered another remarkable issue with Green Arrow #16, the jaw-dropping and emotionally charged ending of this penultimate issue of Emerald Outlaw raises the stakes to a whole new, and entirely unexpected level, and it sets everything up for a momentous action-packed finale for this brilliant story arc. Can’t say I know much about the Green Arrow, but I must say, that cover is great. Lovin’ the book. Great review Paul! Totally agree that Green Arrow has been one of the strongest Rebirth titles. It has done some really good things with Oliver that have helped push him forward as a character.